The Elephant and the Nun has brought a quirky, artsy, experimental vibe to spaces across the central area of Southwark for the past three years. By involving local artists and community groups in the creation of the programme, we have had a truly eclectic selection of events and this year we are combining all of that into one spectacular festival in the beautifully redeveloped Burgess Park. Bric a brac, tea stalls, auctions, pet competitions, vegetable exhibits and firemen. Enjoy mudflapping lessons from Peter the Dance Instructor, rockabilly band The Teenage Men, Men in Coats’ Greatest Show on Legs, and the ping pong skills of Olav Stahl. Get a blast from the past with Dr Martin’s incredible time machine and a peep into the future with as mystery fortune teller Madame Cassandra. Stroll around Nunhead’s very own sculpture park created by Jeremy Hughs, and grab a story from Rye books around the village pond. Brought to you by Pull the Other One. It’s just a good old fashioned village hall. No messing. Produced by Continental Drifts and Tracey Smith. This ground breaking programme features the best emerging musical remix talent in Southwark, London and the UK. Watch out for the catchy tunes and stomping beat of Cable Street Collective and the dulcet tones of Jumoké Fashola, and dance the afternoon away to Bronzehead’s all-original interpretation of afrobeat. 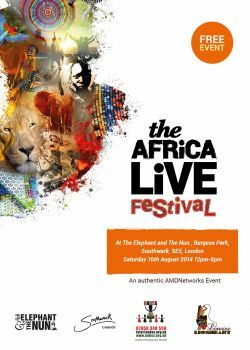 The Africa Live Festival event showcases the very best in African culture through a celebration of the uniqueness and diversity of Africa and the Diaspora. There will be African influenced goods, enjoy arts and crafts, fashion, sample the true diversity of cuisine representative of the African Diaspora and enjoy an eclectic mix of live performances. To celebrate the first year of the opening of the new BMX track there will be a variety of activities at the track including taster sessions, strider bikes for younger children, demonstrations by elite riders and race events. Perfect for all the family is Rollapaluza, a unique cycle sport where you can reach speeds in excess of 50mph and we will have several screenings throughout the day of the documentary 1 Way Up about our very own Peckham BMX. Keep an eye out for the youth service music and media buses and a passing parade. Older artists from the Art in the Park Four Corners group exhibit work inspired by the local area for the Put it on The Map project. Art in the Park Studio, There will also be a chance to see photographs of Elephant & Castle and Walworth from the Southwark Local History Library and Archive. In partnership with Notting Hill Housing Trust, Creation Trust, The Latin American Multicultural Group and The Movement Factory, The Aylesbury Live presents and amazing dance performances and demonstrations from local groups from in and around the neighbouring estate. it isn’t just for watching; get involved and join in with a bit of zumba, boxercise or street dance, as instructors teach you the basics. Hosted by top DJs, this vibrant stage will feature music and dance by young people for young people. Produced by No More Excuses and Small Green Shoots, this stage will showcase London’s young talent. All the old favourites: rides, stalls and games at Irvin’s funfair. Rummage through clothes, bric a brac and second hand goods to find your treasure and bag a bargain. The Elephant and the Nun is one family festival this summer not to be missed. With a super massive funfair from George Irvin, try your hand at something healthy with Creation Trust and the super 7 sports challenge from the sports clubs based in the park. The Elephant and the Nun takes place in Burgess Park, a combination of large expanses of grass with tarmac paths. There are sheltered areas (marquees) and non-sheltered areas. Weather and ground conditions may be variable. There will be sign posted information and first aid points located within the same area on the site.